It is with a wide range of emotions that we are announcing that Imladris Shilohs will be having puppies. This is a planned "pairing" that was not supposed to happen for at least another year. I failed the Breeder 101 - "Keep 'Em Separated" course! We have confirmed that Nottingham's Laerwen O' Imladris (Lyra) will be having pups sired by OceanState's Elessar of Imladris (Strider). 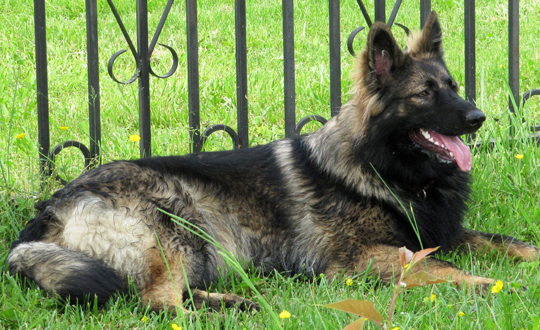 Lyra is a beautifully coated, brown sable girl with an independent, yet loving personality. She has a correct topline, great bone, nice head and a lovely saber tail. Lyra brings with her lines a double new blood in the 4th generation from Ember combined with old lines via her sire Elvis. Her health testing will be completed as soon as she is 18 months. Strider is a big teddy bear. He has a medium soft temperament and wants nothing more than to be with you and be loved on. He is tall and of moderate width, has good bone, and a beautiful head. He is excellent with everyone he meets, yet he is an outstanding family guardian. 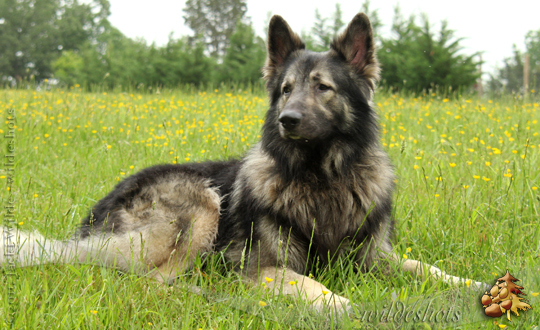 Strider brings an impressive pedigree of pure old lines to this breeding. He has his breed championship and has passed his herding instinct test. With the combination of these two we should see broad puppies with nice bone, height, great heads and excellent temperaments and intelligence. We expect a variety of plush puppies with most being sable but with the possibility of duals. All pups will be sold as pet quality with the option to upgrade pending Lyra's successful completion of all her health testing. The litter will be registered with NKC. Please fill out an application if you are considering a pup from this litter as interest will be high.